It's Monday and around here that means it's a Mommy Monday! Mondays can always be a bit tough because John goes back to work. And since he leaves before the girls are awake, they definitely miss their Daddy (and so do I)! I would be happy if we both got to be stay-at-home parents...but I guess someone has to pay the bills! So I always try to make Mondays extra special with cuddles and treats or a special activity. This morning we had a really fun playdate, and this afternoon we will head over to Nana and Pop-Pop's house to play outside and enjoy the amazing weather that we are experiencing today! But onto our Paisley Update! I had a doctor's appointment last week, and Mama and Baby are both doing great! I got to hear Paisley's heartbeat, which is always wonderful! I am still feeling good, but definitely getting less and less sleep as the weeks progress. My heartburn is also in full force, and I am up to about 10 tums per day, so sweet Paisley better have a head full of hair! She is also in full moving and grooving mode, and is kicking me a ton! I got to feel Paisley move pretty early on in my pregnancy, and she doesn't even like to stay still ever... so I have a feeling we are in for a feisty baby! Here is my 23 Week Baby Bump! It's getting bigger by the day! 24 Weeks was last Friday (September 5th) but I didn't get to take a picture until Sunday, which also happened to be Derek Jeter Day! So I thought I would throw on John's Derek Jeter Jersey for the pic! 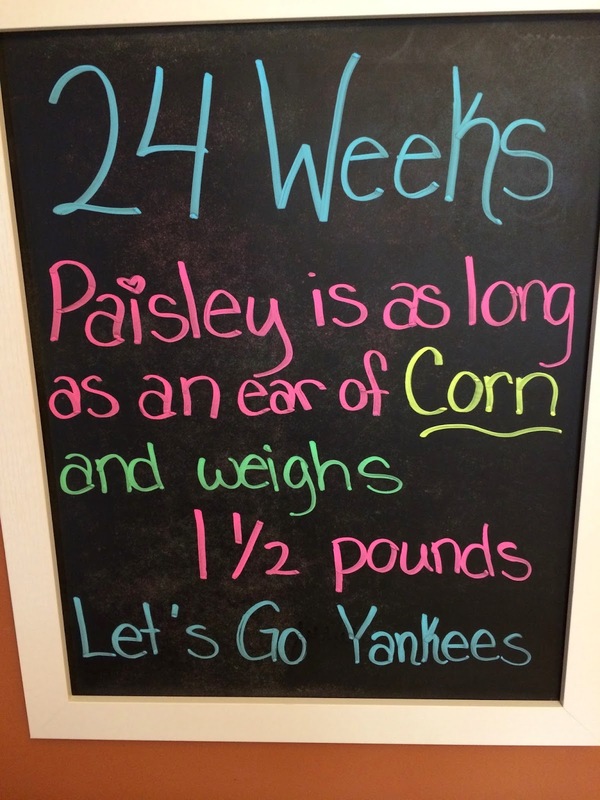 You can read about our love of the Yankees in this post! 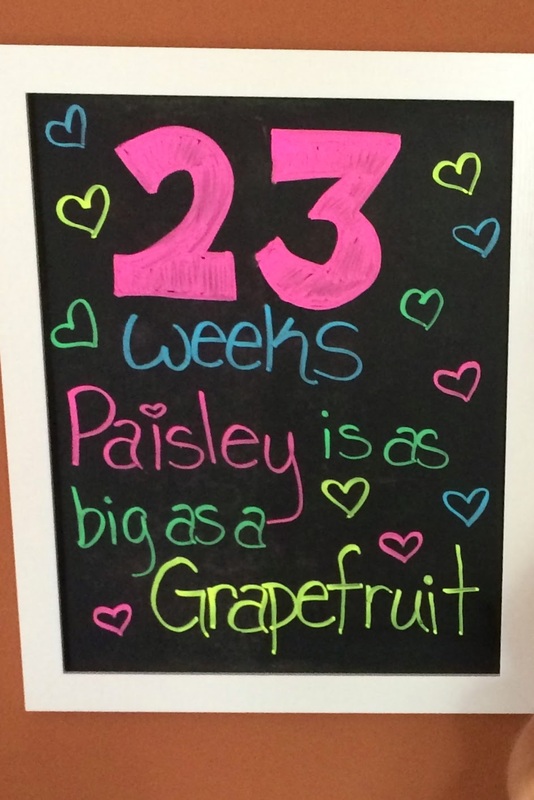 My 24 Week Chalkboard! It's hard to believe that I am already 6 months along (almost 3rd trimester) and that Paisley Jean is already 1 1/2 pounds! Although with my big baby track record, she is probably larger than what my pregnancy app says! Stay tuned for more Paisley Jean updates! At my next doctor's visit I get to do my Glucose Test...ugh!